Airwheel twin-wheel scooter turns into a stylish fashion in the street. Abstract: Airwheel twin-wheeled electric scooter, like Q5 and Q1, is designed for girls, which enjoys exquisite appearance and quick reaction. Airwheel two-wheeled electric scooter is designed for elites. Two-wheeled design guarantees stable and comfortable riding experience. A3 is the new-added type and it is famous for sitting-posture riding mode. Nowadays, a familiar phenomenon often appears in high streets and back lanes, which is riding Airwheel electric scooter. Based on advanced science and technology, Airwheel electric scooter can take people to weave in high streets and back lanes freely. The following would like to unveil such a new fashion in details. Specifically speaking, Airwheel electric scooters can identify users' potential commands quickly and precisely. For example, accelerating and decelerating can be accomplished by leaning forward and backward separately. If riders want to change direction, it just requires them to turn their bodies. 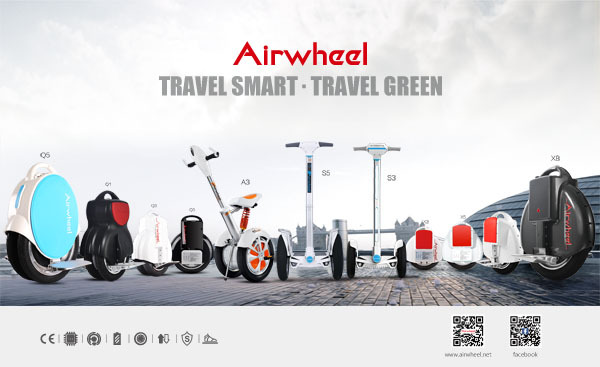 The reason why Airwheel twin-wheel scooter become a new fashion is largely because they enjoy wide applications. 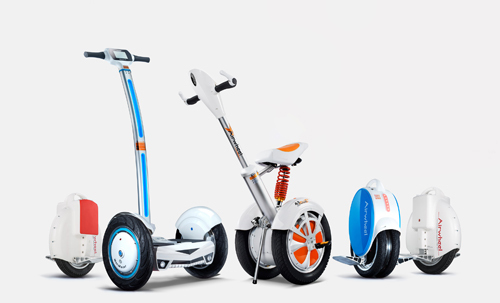 There are several different types of electric scooters under Airwheel, which is helpful to widen both applications and consumer base. Airwheel electric unicycle is small-sized and light-weighted, which is often used to solve “the last five kilometres.” Airwheel twin-wheeled electric scooter, like Q5 and Q1, is designed for girls, which enjoys exquisite appearance and quick reaction. Airwheel two-wheeled electric scooter is designed for elites. Two-wheeled design guarantees stable and comfortable riding experience. 4-inch LED displayer clearly shows some real-time data, such as remaining electricity, temperature or current speed. Besides, it is also equipped with music play function. S5 also belongs to two-wheeled electric scooter, but it is a unique type. It is hailed as personal exclusive SUV scooter, because the biggest battery capacity, longest range and largest wheels make it be able to challenge the real nature. A3 is the new-added type and it is famous for sitting-posture riding mode.